To celebrate the impending launch of weather satellite Metop-B, we held a twitterview – an interview conducted on Twitter, with EUMETSAT. 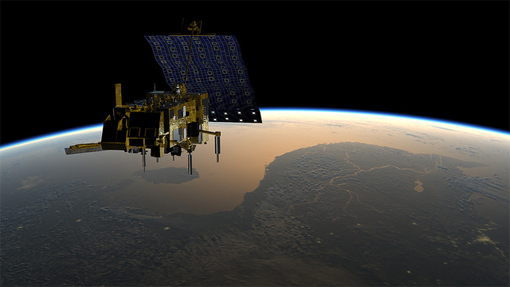 Metop-B, due for launch on 17 September 2012, is the second of the EUMETSAT Polar System (EPS) satellites, which provide data for use by meteorologists and climate scientists wordwide. Artist’s impression of a Metop satellite in polar orbit above the Earth. Q6: @metoffice What difference will the launch of #metopb make to you? For news and updates on Metop-B, visit the EUMETSAT Metop-B launch site. To find out more about how the Met Office uses weather satellites, visit our satellite applications pages. This entry was posted in Met Office in the Media and tagged EUMETSAT, Met Office, Meteosat, Metop-B, Twitter, Weather satellite. Bookmark the permalink.